Downstream processing of Biosimilar Monoclonal Antibody utilises variety of raw materials that a critical for achieving the desired product quality. 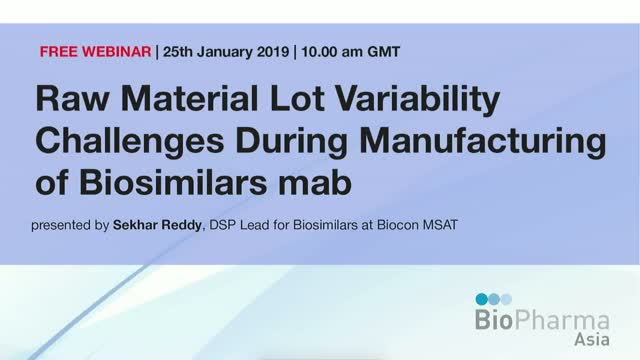 In this webinar, we would like to discuss the data from three cases of lot to lot variability namely Depth filtration, Chromatographic resin and buffer component used in downstream chromatography unit operations. Changes in lots of depth filter resulted in significant clogging and differences in Host cell impurity clearance. Similarly, changes in resin lots resulted in increased back pressure during processing and variability in buffer raw material lots resulted in undesirable colouring of resin upon contact. In each case, we will present the root cause investigation, impact on product quality profile and associated CAPAs to control the effects of variability to ensure manufacturing continuity.